Cupola di bucatini – the Sunday project: Sunday is a day of catch up for us here at The Big Dream Factory. We often spend it simply reading, researching and rejuvenating in preparation for the coming busy week. It’s during these times of rest that we come across an idea that is irresistible and has our creative juices working on overdrive! Today was is of those days. Magnificent, don’t you think! 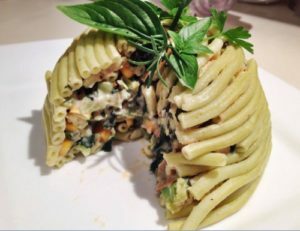 Spurred on by energy that we simply can’t explain, we decided to give it a go using some wonderful fresh vegetables for the filling and our own fresh spinach bucatini to form the cupola or ‘dome’. Sauté all the ingredients for the filling (except the cream cheese), in the olive oil. Remove from the heat and add the cream cheese. You want your filling to not be saucey but thick and relatively chunky. 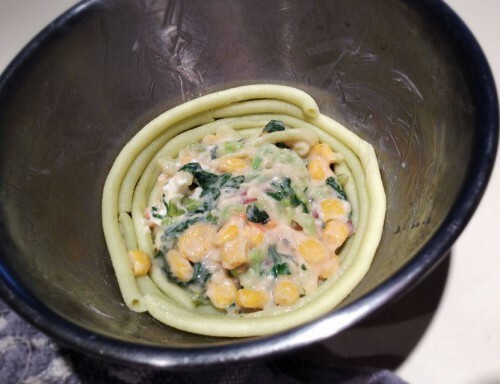 Chop up 1/3rd of the cooked bucatini and add it to the filling. 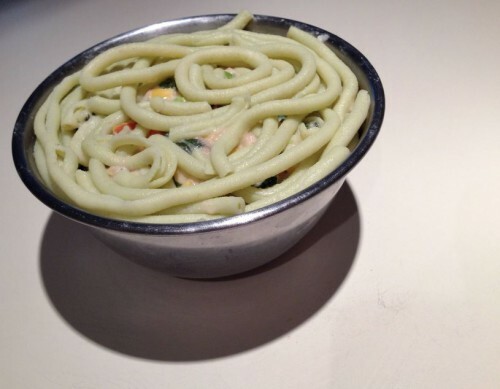 Liberally grease an oven-proof bowl with butter and once the bucatini is well drained, begin to line it a little at a time. This will help to reinforce it as you go. 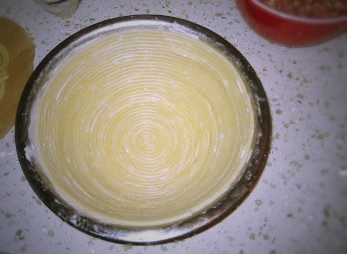 Continue to the top of the bowl and cover the filling with any left over bucatini. 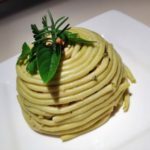 Some people are very good at this and we found an example of this particular portion of the recipe being executed perfectly by Thanks, I made it.com. See below! 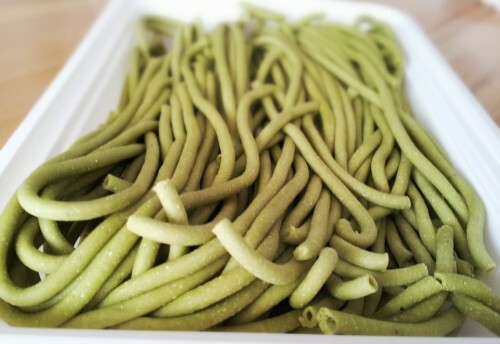 We tried our best but there is a difference between our fresh pasta and dried pasta. We fold it. It is not in long strands and so has the occasional ‘kink’. This made it tricky to shape around our bowl. Preheat the oven at 365F/185C. 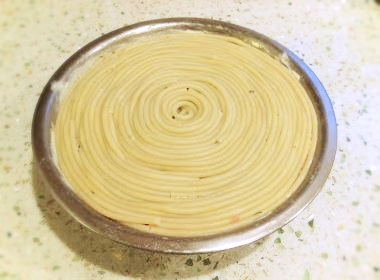 Once you have finished up twiddling with bits of bucatini, press the top gently but firmly to ensure that the filling is compact then cover the bowl in foil . Place it in the centre of the oven for 20 minutes then uncover and continue cooking for a futher 10 minutes. 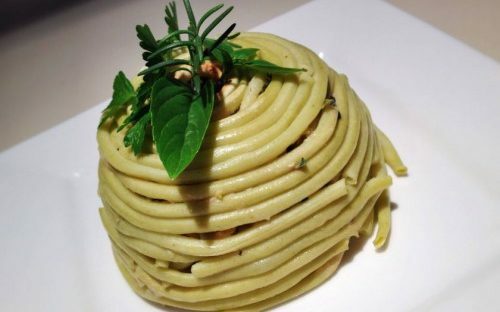 Place a serving plate over the top of the bowl and turn over to remove the stuffed dome of bucatini. VOILA! 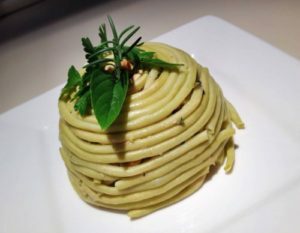 Our cupola di bucatini doesn’t look as perfect as this next effort from Lex Culinaria that started us on this journey in the first place. 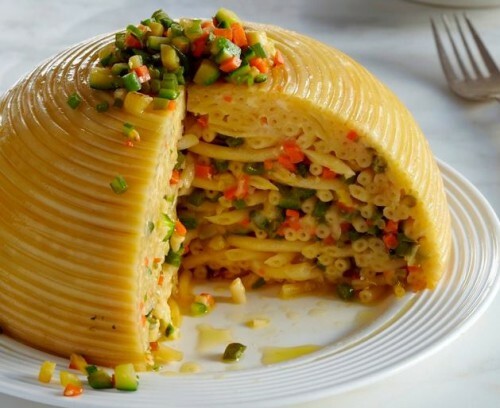 However, they have used ziti and not bucatini so there are some lessons to be learned if you are seeking perfection. We were never seeking perfection, as clearly demonstrated in the photograph above! 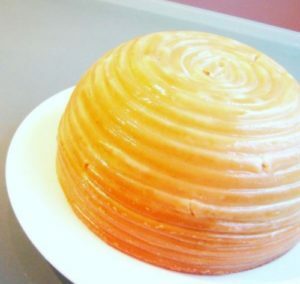 So what happens when you slice one of these babies open?! TUH DUH! !